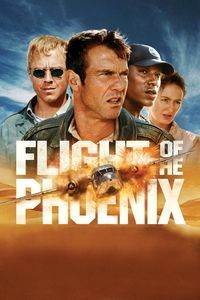 (In theaters, December 2004) Curse the lack of restraint of modern directors with an AVID editing station in their hands: Flight Of The Phoenix is a perfectly respectable old-school adventure, and it calls for a classic tone. For most of the film’s duration, that’s indeed what we get. But from time to time, the film segues into gratuitously wierd jump-cuts, dream-like sequences and other assorted modern trick that simply don’t work. Those moments don’t do much to compensate for the pedestrian dialogue and the iffy geographical coherency of the location. (My favourite moment is when they walk away from the side of the plane and end up in debris having fallen out of the plane earlier… which would place them behind the plane wreck! And that’s saying nothing about how the plane is at a handy distance away from dunes, nomad camps and natural runways.) Other annoyances abound; the look and development (“That’s my watch!”?) of the nomad camp encounter; the ridiculously extreme drama of some scenes and the jarring inclusion of “Hey Ya!” as a montage song. Still, there’s also enough to like in the film for everyone looking for a little adventure, from a spectacular plane crash that ensures that this will never be an in-flight movie to a refreshing lack of sexual tension between the protagonists and the lone woman in the team. Some of the desert cinematography is a thing of beauty, Randy Quaid delivers a good gruff performance and there’s a remarkable purity in the premise of the film. But it’s easy to see how The Flight Of The Phoenix could have been improved, and it’s a shame that it wasn’t.